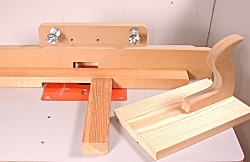 If your router table is fitted with a mitre fence and you want to use the table fence to control the size of cut, e.g. the shoulder of a tenon, the table fence must not only be set back the correct distance from the cutter, but must also be exactly parallel with the mitre fence slot. This point is often imperfectly understood. If you don’t use a mitre fence, the second requirement doesn’t arise. Since most work involving a mitre fence is done with the workpiece at right angles to the table fence, it’s much quicker and easier to use simple right-angled fittings to guide the work. If you use a mitre fence, you can make it more efficient by screwing an auxiliary fence to it in order to lengthen the bearing surface for your workpieces. If the wood has a tendency to slip you can cure this by sticking a piece of coarse grit abrasive paper to the auxiliary fence. 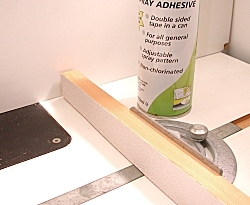 If you don’t have self-adhesive abrasive you can stick the ordinary sort with a spray adhesive. Mine came from the local timber merchant and is a very useful workshop item. When using your mitre fence for operations such as scribing rails, put a piece of scrap batten between the fence and the workpiece to prevent breakout and protect the auxiliary fence.